Among his many achievements over a lifetime of aviation excellence, Calvin Pitts has become the first significant establishment figure to publicly embrace the truth in the Earhart disappearance, and we’re honored that he brought his considerable experience and talents to this blog and shared it with us. Without further delay, here’s Part II of Calvin’s analysis. 8. Contingency Plan: HERE IS WHERE we zero in on the WHY of this so-called mystery, which is actually only a mass of confusion. The next couple of clues have to do with Amelia’s relationship with a top government bureaucrat, Eugene L. “Gene” Vidal (father of Gore Vidal), and the flight made to the area where she was forced to make a fatal decision. We call it “Area 13,” and when we get there, you’ll see why. (1) Why was the failure in Honolulu of flight No. 1 so critical to the final outcome? (2) After the Hawaii crack-up, did a military issue change the entire course of the flight? (3) What caused the decision to reverse the direction of Flight No. 2 from west-toward-Howland to east-toward-Area 13? There is more here, it seems, than meets the eye. 4) From Area 13, why was the Contingency Plan ignored after being so carefully prepared in favor of an intentional heading toward another destination? 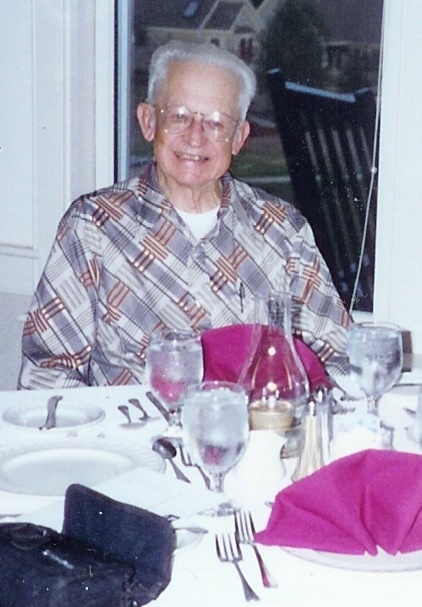 Gene Vidal was a standout individual in America in the 1930s. He was a respected graduate of West Point, a star athlete in various sports, the quarterback of their football team, and he was recognized as an outstanding aviator. He was a star in the heady world of Washington, the head of a new, growing department, the Bureau of Air Commerce (BAC). He was a friend of the president and he innovated new programs for aviation’s growth. He was also handsome and his picture was featured on TIME magazine. On top of those 12 outstanding attributes, Gene Vidal was deeply respected by the most famous woman in America. That’s No. 13, and that’s good luck, isn’t it? 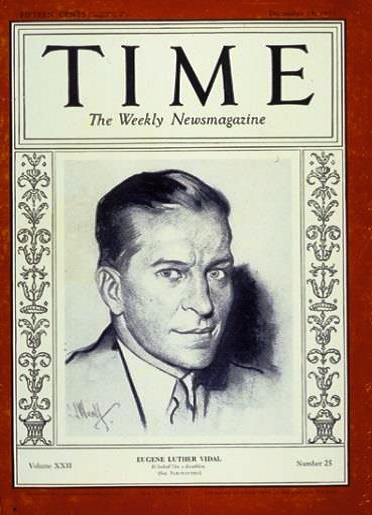 Eugene L. “Gene” Vidal, Time magazine, Dec. 18, 1933. Vidal was President Franklin Roosevelt’s top civil aviation director from 1933 to 1937, and from September 1933 to March 1937 he was Director of the Bureau of Air Commerce, a predecessor of the Federal Aviation Administration in Washington, where he organized and expanded the government’s civil aeronautics program. Amelia also had great respect for George Putnam and his accomplishments. He supported her in everything she did. He was her fan as well as her husband. They were good partners in things they did together. They complimented the needs of each other, even though, at first, she reluctantly married him. Amelia had captured the heart of America, or at least its attention. What lady wouldn’t be proud of that in those times? As friends, Amelia and Gene worked together in aviation pursuits. As mates, Amelia and George worked together in achieving her dreams. George Putnam was a promoter and publisher, his company having published “WE,” by Charles Lindbergh. When Amelia needed personal help, including with her career, she turned to him. Gene Vidal was a bureaucrat, aviator and director of the Bureau of Air Commerce, Washington, D.C., with political influence. When Amelia needed guidance and help in aviation matters, she went to Gene. All three of them were friends. As a Civil Aeronautics Administration (CAA), later Federal Aviation Administration (FAA) top government bureaucrat in the BAC, under Daniel Roper’s Department of Commerce (DOC), Eugene Vidal was extremely knowledgeable — West Point graduate, sports superstar, one of the best pilots in the country, TIME magazine feature personality — and a handy government man to have around. Not only was Vidal West Point’s star, he was also the government’s star and a luminary, at least in his own mind. But he did not get along with major figures with whom he worked, and got crossed with his office partner, J. Carroll Cone, as well as his immediate boss, Daniel Roper, DOC secretary. And most significant of all, he got crossed with his ultimate boss, President Franklin D. Roosevelt, the heart and soul of the government. That, of course, takes talent, or at least a massive sense of self-importance. But Vidal knew aviation. And he knew that a dear friend needed guidance in so great a challenge as a successful flight around the world, especially on that long leg across the open waters of the Pacific. What should Amelia do if she was unable to locate that postage-stamp-bird-infested–land-mass called Howland? 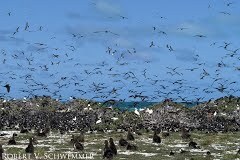 A look at the teeming wildlife on Howland Island, so overpopulated with “10,000 frigates, 8,000 boobies (albatrosses), and 14,000 terns,” according to Army Lt. Daniel A. Cooper, writing in July 1937, that many doubted that Amelia Earhart really intended to land there when she disappeared on July 2, 1937. HOWLAND? What was it about this piece of land that was so strategic? That decision, however, of locating a dot in the sea would never have been necessary if flight plan No. 1 had not failed. But it did, and the circumstances which followed determined the details which led to a sad tragedy. That needs to be explored. However, because flight No. 2 is the flight which is known best, and is discussed most, we’ll follow it to “Area 13,” at which point we’ll pause and ask: What happened? What went wrong? Why did a flight conceived in innocence get hijacked and become so complicated as to become a flight into hell. In the beginning, we could take things at face value. But afterward, the face was not what it seemed. More often than not, it was a false face. The government face, hidden for so long, left a long shadow, and was far uglier than the public was led to believe. The leg of Flight No. 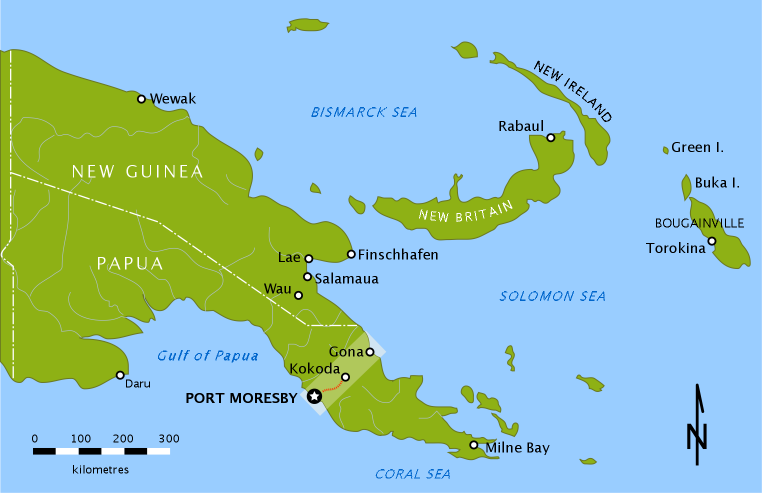 2 that was the most dangerous and most challenging was the one from Lae, New Guinea to Howland Island. It was full of challenges, decisions, changes and surprises — a surprise that held a double-surprise. 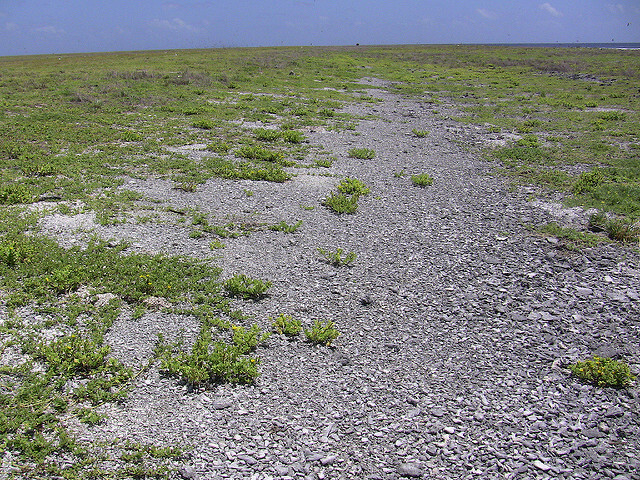 This is what’s left of the Howland Island runway. 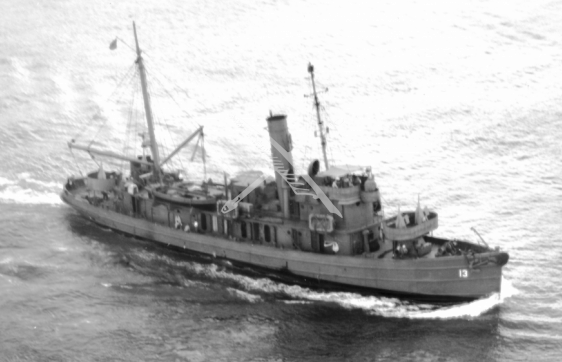 However, the Electra’s crew was already unable to receive Morse code messages from the Coast Guard Cutter Itasca at Howland, and the Navy’s USS Ontario tug which had been placed halfway between Lae and Howland. One source says that both Amelia and Noonan were able to understand code, which is only partly true if the speed in sending means that the one receiving hears sounds but cannot interpret them. 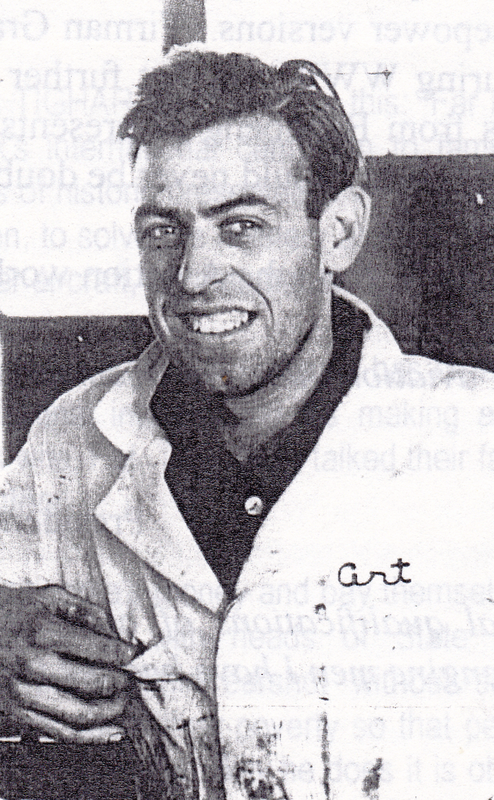 Fred Noonan had a second-class radio license, and he had been communicating slowly in code en route from Darwin to Lae, according to Alan Vagg, the radio operator at Bulolo, 40 miles southwest of Lae. But Amelia did not really know Morse code, although she had been advised earlier by a close friend to spend time learning it. This raises two difficult questions: (1) Why did they remove the Morse code key at the beginning of the flight, making it difficult if not impossible for Noonan to communicate by code, unless he had his own personal key? What was the purpose in removing it? (2) Why were the Ontario at sea and the Itasca at Howland totally uninformed that the multitude of Morse code messages they sent would go unanswered, because Fred could only understand code if it were keyed very slowly, and Amelia’s knowledge consisted of only a few letters? This was a critical issue. When can beauty be hell? When you can’t find a place to land. “Two different sets of keys?” How many knew that? Two? For what purpose? Compounding this radio issue was a profound misunderstanding between Amelia and the Itasca regarding the important intricacies of frequency incompatibility and DF usage. That was a radio disconnection, to be sure. When the Electra left on the morning of July 2 at 10:00 am local time, they were ill-equipped for the radio challenges ahead. On flight No. 1, Amelia had Harry Manning, a seagoing captain on vacation for purposes of helping that flight that ended in Honolulu. He was well-versed in radio usage and intricacies, but he bailed after the crack-up at Luke Field. 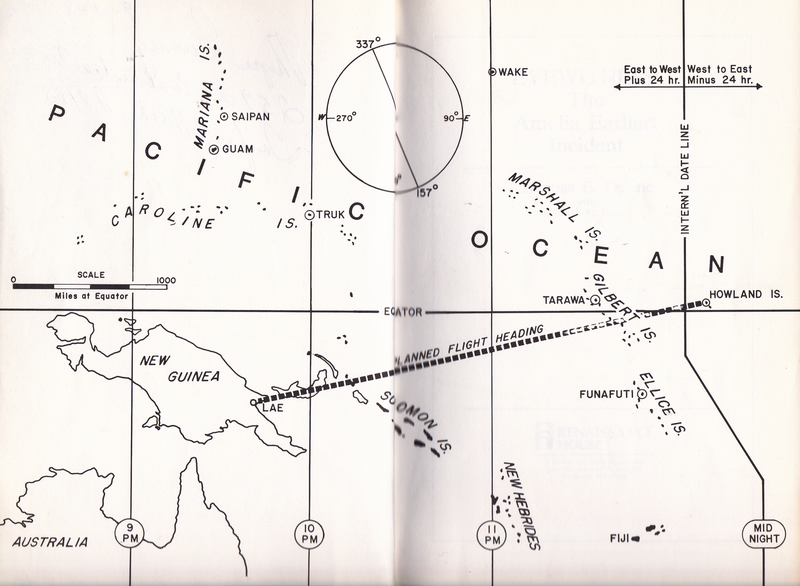 The greatest area of confusion for the observer is the neglect in getting the radio frequencies and usage clear in one’s understanding, as well as clearly communicating to other personnel such as those on the Itasca, the Ontario, Lae radio, Nauru radio, Tarawa radio in the Gilbert Islands, and Hawaii radio. Why were all these facilities not properly notified? What was the big secret? Why were they not in the communication loop? The second area of confusion was the casual and strange way in which the radio calls and position reports were made, and the technique of using the radio properly for getting bearings. In this post, we’ll take a look at the track of flight No. 2 as it relates to the Pacific crossing, noting the changes made due to weather and necessity. Two diversions to the initial plan added more than 100 miles to the flight, but it kept the fliers out of serious thunderstorms and it gave them a positive land fix at Nauru. Lae is our point of origin. Howland is our destination. Unfortunately, Howland doesn‟t remain our destination, for reasons that need to be explored. But even at Lae, things did not go as planned. With a heavy fuel-load, the Electra had no place to go but into the water of Huon Gulf if the takeoff had to be aborted. As it was, the Electra used up 97 percent of the dirt strip they called a runway, lifting a few inches before beginning to settle beyond the cliff. As they rolled down the 3,000 feet of rough dirt at more than 35 percent over gross weight, they watched the performance of Lockheed’s modern design of what became a classic airplane. It has two great Pratt & Whitney Wasp 550 horsepower/600 horsepower (at takeoff) engines, but the wheels are still not leaving the ground as they neared the end of the 3,000 feet available. The fuel-heavy plane with 1,100-1,150 gallons flies into the air off the cliff above the Huon Gulf, and begins to settle, settle, settle until it was just a few feet above the water. An incoming plane later describes what he sees. By the time the Electra stops its descent and settles into a slight climb of 30 feet per minute, the Electra is leaving behind a spray of water from the prop-wash of the spinning lifeline. Amelia set up a rate of climb of 30 feet per minute, predetermined from the manual with input from Kelly Johnson, Lockheed’s later designer of the 9D Orion, the model 18 Lodestar, the PV-1 Ventura, the PV-2 Neptune, the PV-2V Harpoon (which I’ve flown to airshows), the P-38 Lightning, the TWA Constellation, the P-80 Shooting Star (my first Jet to witness at age 12), the F-104 Starfighter, the C-130 Hercules, the U-2, the SR-71 (which I’ve visited at Beale AFB), and the Electra 10 (which I’ve also flown), 40 in all. Such a cruise climb was the most efficient. By 0115z (GMT) (11:15 a.m.), an hour later, Amelia let local radio operator Harry Balfour know she was still “climbing to 7,000 feet,” not the plan Kelly Johnson of Lockheed had laid out for her. Due to severe thunderstorms resting above the original planned course, Noonan, with help from Balfour, decided to fly due east to the Solomon Islands. At Choiseul’s Mount Maetambe, weather permitting, they would turn northeast toward Nukumanu Atoll, sitting very near their original course. So not even the first leg was going as planned. For the first seven hours, Harry Balfour was Amelia’s lifeline. He was the last to have two-way radio contact with the Electra. 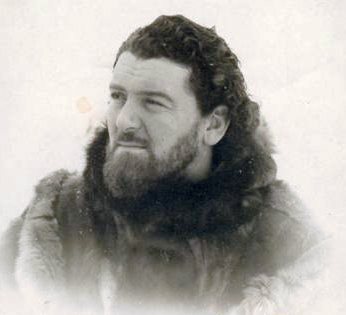 He also helped Amelia and Fred make a decision to go slightly north, a little out of their way, to use Nauru as a land-fix before the long eight-hour night flight to Howland from a known position. Balfour and the mechanics had served the Electra crew well. But after Nukumanu at 0718z (5:18 p.m. Lae time), when Amelia changed frequencies from day (6210 kilocycles) to night (3105 kc), he never heard from her again. Balfour requested that she stay on a frequency where she was being heard, but he received no reply. Harry Balfour, circa 1937, the radio operator at Lae, New Guinea, the last person to carry on a two-way radio conversation with Amelia Earhart. One can assume that with darkness coming on within an hour or so (it was now about 5:30 p.m.), she was changing the frequency early in order to establish contact with the USS Ontario, commanded by Navy Lt. Blakeslee. If they were diverting slightly north in order to get a land-fix over or near Nauru, she certainly wanted to inform him of that. The Navy had sent this tug, now being used for minor assignments in Samoa, to serve as a floating radio and weather station for the Electra at a midpoint of that leg. Unfortunately, what neither of them knew at that time was the agonizing fact that the Electra was not equipped for low-frequency broadcast, and the Ontario was not equipped for high-frequency. The Ontario had stated that it would broadcast on 400 kc. The Electra was not equipped for this low frequency. Why didn’t they know about this incompatibility? Who was in charge of communication arrangements? They didn’t know for the same reason, perhaps, that the Itasca personnel were not aware of other frequency anomalies and DF limitations. Who went to sleep on those details? Commander Thomson of the Itasca was not the only one who later blamed George Putnam for overlooking such details. But where was Vidal, or Noonan, or even Amelia? Somebody dropped the ball, and it fell with a fatal blow — unless there was already a bigger event in play. After changing frequencies to one that the Ontario could not receive, it is safe to assume that Amelia made several voice calls. Morse code, of course, was already out of the picture. We’ll conclude Calvin Pitts’ fascinating analysis in our next post. Once again, the opinions presented in this piece are Calvin’s, and are not necessarily shared by the editor. As always, your comments are welcome. 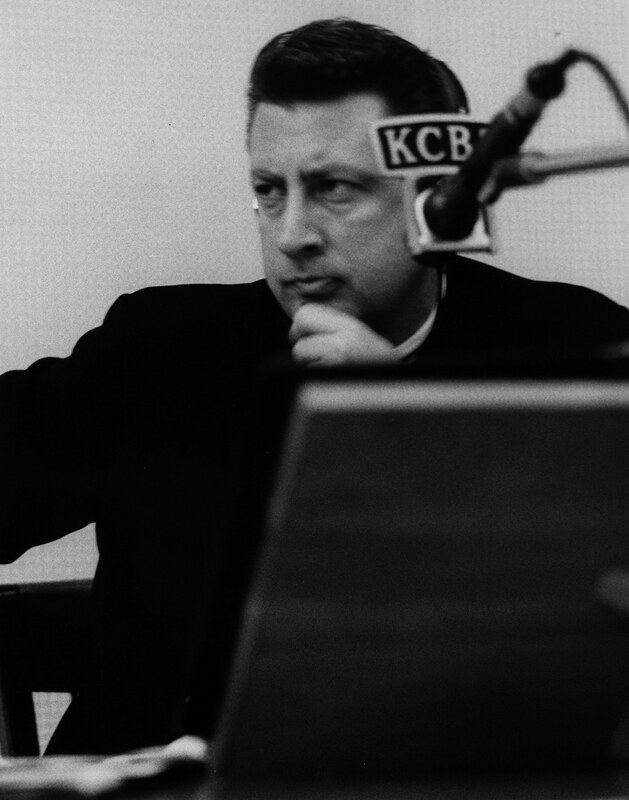 Today we return to the early 1960s correspondence between KCBS radio newsman Fred Goerner and retired Coast Guard Lt. Leo Bellarts, who as the chief radioman aboard the Coast Guard Cutter Itasca, was on hand to hear Amelia Earhart’s last official messages on the morning of July 2, 1937, concluding with her last transmission at 8:43 a.m. Howland Island time. For Bellarts’ Nov. 28, 1961 letter to Goerner, posted Feb. 6, 2017, as well as the author’s reply, please click here. Bellarts Dec. 15, 1961 response to Goerner, posted April 24, 2017, can be seen here. CBS Radio – A Division of Columbia Broadcasting System, Inc. Thank you very much for your letter with enclosures of the 15th. It was received with a good deal of interest by all of us who have been working on the Earhart story. I’m sorry if I took on the proportions of a “quizmaster” to you. I think it must be the reportorial instinct. I learned long ago that if you don’t ask the questions, you very seldom get the answers. First, let me answer several of your questions. As far as I know, there is absolutely no connection between CBS and Mrs. Studer; in fact, I have never met her, and I found the article you mentioned slightly on the irritating side. That article was the first time I was even aware of her existence. As to George Palmer Putnam, I never had the opportunity to meet him. He died in January, 1950. The only members of Amelia’s family I know personally are her mother and sister who live in West Medford, Massachusetts. The mother [Amy Otis Earhart] is now in her nineties, and her sister [Muriel Earhart Morrissey] teaches high school in West Medford. I was glad to receive the information that Galten was a bona fide member of the Itasca’s crew; however, it leaves me even more at a loss to explain his remarks to the press to the effect that the Earhart [plane] was incapable was transmitting radio signals more than 50 to 75 miles, and that the seas were eight feet with fifteen feet between crests the day of the disappearance. The Itasca Log indicates as you have that the sea was calm and smooth. You might be interested in Galten’s address: 50 Solano Street, Brisbane, California. We know as a positive fact that the Lockheed had sufficient gas for twenty-four to twenty-six hours aloft. The take-off time from Lae, New Guinea, was 10:30 a.m. at Lae, 12:30 p.m. at Howland. It was possible for the plane to have stayed aloft until 2:30 p.m. Howland time the following day. The July 2 transmission from the Itasca to San Francisco estimates 1200 maximum time [i.e. noon local time] aloft. Why then the supposition that Earhart “went in” right after her last message at 0843? It just isn’t true that Earhart and Noonan began their flight from Lae to Howland with just enough fuel to reach Howland and no more. They were fully aware of the navigational hazards of the flight. The planning for that 2,556-mile flight is contained in Amelia’s notes which were shipped back to the United States from Lae. She planned her ETA at Howland just after daybreak. Daylight was absolutely necessary to locate that tiny speck. She had figured her fuel consumption to give her at least six additional hours to make a landfall if Noonan’s navigational abilities did not bring the plane dead center to Howland. The Lockheed Electra 10E, an all-metal (aluminum), twin-engine, low-wing monoplane with retract-able landing gear, designed as a small, medium-range airliner, and powered by twin Pratt & Whitney R-1340 Wasp S3H1, 600-horsepower engines. The plane was 38 feet, seven inches long with a wingspan of 55 feet and a height of about ten feet. The Electra had an empty weight of 7,100 pounds, with a total fuel capacity of 1,151 gallons in ten tanks in the wings and fuselage. Your comment that she simply forgot to include the reference point in the final message seems to be negated by the fact the she included “running north and south.” If Noonan had been able to give her a reference point, there would have been no reason for running north and south courses. They would have known their exact position and in which direction to fly. The variance in the two groups of messages sent to San Francisco by the ITASCA is not the result of “faulty press reports.” I’m going to have my copies of the Coast Guard Log photostated and sent along to you. The amazing discrepancies are clear and incontestable. Your quotes from TIME magazine are “faulty press reports.” TIME is wrong that no position reports were received after Earhart’s departure from Lae. The Coast Guard Log indicated a check-in 785 miles out from Lae with a full position report. TIME was also mistaken in the number of messages received by the ITASCA from the plane. It varies from your own list. Yes, I was aware that the COLORADO refueled the ITASCA. This is indicated in the Navy’s official report of the search. The Navy report indicates that the COLORADO, on a naval training cruise in the Honolulu vicinity with a group of reservists and University Presidents [sic] in observance when it was ordered to assist in the search and refuel [of] the ITASCA and the SWAN. I’m afraid I’m going to have to resort to another list of questions. There is so much that appears to be unanswered in this entire vacation. I think you are as interested in this as I am, or I wouldn’t bother you. Was the signal strength of Earhart A3 S5 on all the messages from the 0615 “About two hundred miles out” to the final 0843 message? In your list A3 S5 is not listed for 0615,0645, 0742 and 0800. Many radio operators have told us that in the South Pacific, particularly near the equator, a voice signal will come in from any distance so strongly that the person appears to be in the next room, then, a few minutes later, it cannot be raised at all even when the transmission station is only a few miles away. 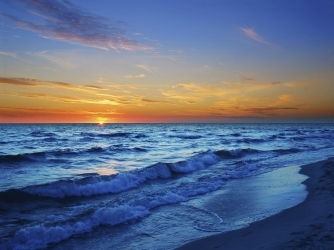 Was this your experience while in the South Pacific? Did the ITASCA make any contact with Lae, New Guinea to set up radio frequencies before her final take-off? Did the ITASCA contact Lae to determine the actual time of the take-off? Was the ITASCA aware of the gas capacity and range of the plane? If the ITASCA arranged frequencies with Earhart at Lae, or at least firmed them up, why didn’t the ITASCA know that Noonan could not use cw [sic, i.e., Morse Code] on 500 kcs because of a lack of a trailing antenna? The “Organization of Radio Personnel” Photostat indicates that in the event of a casualty the ITASCA was to block out any other station attempting to communicate information. What other station was near the ITASCA that might transmit information contrary to fact? When the plane was lost, did the ITASCA block out any other transmission of information? Do you know of the whereabouts of [RM2 Frank] Ciprianti [sic, Cipriani is correct], [RM3 Thomas] O’Hare, [RM3 Gilbert E.] Thompson, Lt. Cmdr. F.T. Kenner, Lt. (j.g.) W.I. Stanston or Ensign R.L. Mellen? This is aside from the Earhart matter, but is certainly of interest. What was the eventual fate of the ITASCA, ONTARIO, and SWAN? In closing, Mr. Bellarts, let me say that we sincerely appreciate the opportunity the [sic] with you. Let me assure you that we will keep your confidence, and will in no way quote you without your permission. I, personally, have been working on this investigation for nearly two years. It has nothing to do with any stamp that might be issued with her image, or some nebulous entry into a hall of fame. This is a news story, and we intend to pursue every possible lead until a satisfactory conclusion is reached. I [sic] happy to say we have the blessings of both Amelia’s mother and sister. They have suspected for many years that the disappearance was not as cut and dried as portions of our military have indicated, but no one, including that military, has ever put together a concerted effort to tie together the loose ends. I believe with all my heart that Earhart and Noonan were on Saipan. I saw the testimony gathered by the Monsignor and the Fathers. I know the witnesses were telling the truth. There was no reason for them to lie, and such a story could never have been invented by simple natives without the appearance of serious discrepancies. However, I believe with you that Earhart and Noonan never flew their plane to Saipan. They must have been brought to the island by the Japanese. The search for Earhart has been a joke for years. I think that’s because the military has dogmatically maintained that the pair went down close to Howland; yet, that contention appears to be based solely on the belief that the strength of signals before the last received transmission indicated the ship was probably within two hundred miles of the ITASCA. Where did they fly on the four to five hours of gas we know remained? A view of Howland Island that Amelia Earhart never enjoyed. The island, a property of the United States, remains uninhabited, but is popular among various wildlife that nest and forage there, especially goony birds and terns. Note the outline of the original airstrip that was cleared in anticipation of Amelia’s landing. No one, certainly not CBS, has the idea of castigating individuals, the Coast Guard, the Navy or the Air Force or even Japan for something that happened so long ago. The important thing is to settle this matter once and for all, and bring a modicum of peace to the individuals involved. Earhart and Noonan fought their battle against the elements. If they later lost their lives to the aggrandizing philosophy of a nation bent on the conquest of the Pacific, the great victory is still theirs. Their story should be told, and they should receive their nation’s gratitude and a decent burial. Would you ask less for your own? Best wishes for a merry Christmas and a prosperous New Year. I’ll be looking forward to your next communication. I have more of the fascinating correspondence between Fred Goerner and Leo Bellarts, two of the most interesting people in the entire Earhart saga, and will post more at a future date. Fred Goerner’s “In Search of Amelia Earhart” Part I: Was 1984 Orbis retrospective published anywhere? Nobody realized it then, but from the moment Time magazine ripped Fred Goerner’s bestseller The Search for Amelia Earhart in 1966 as a book that “barely hangs together,” the sad truth about Amelia and Fred Noonan’s miserable deaths on Saipan in Japanese captivity was thenceforth treated as a forbidden subject by the U.S. corporate media. By 1984 things were even worse, and speaking of Amelia Earhart and Saipan in the same sentence was reserved for paranoid conspiracy theorists, fringe nuts, like this writer, who were shunned by polite society. The establishment had long circled its wagons around this sacred cow, and still has no intention of admitting a truth that would destroy the grand, well-crafted legacy of Democrat icon Franklin D. Roosevelt. Until recently I believed that Fred Goerner’s fine 1984 retrospective, “In Search of Amelia Earhart,” had appeared in a British publication called Orbis magazine, and stated so in Truth at Last. But now I find there was no Orbis magazine in 1984. Orbis Publishing Ltd. was a United Kingdom-based publisher of books and partworks (a new term for me). The company was founded in 1970 and changed its name to De Agostini UK Ltd. in 1999. It was apparently for Orbis that Goerner penned this piece, but I can’t determine where it actually appeared in Britain — or if it appeared at all. I’ve searched online in vain for any British or American magazine, newspaper or periodical and found nothing that remotely resembles this relatively unknown 9,300-word summary of the most important evidence supporting the Marshalls-Saipan truth at the time. I found it in the Goerner Collection files at the Admiral Nimitz Museum in Fredericksburg, Texas, several years ago, and for true Fred Goerner fans and Earhart aficionados, this is a special treat, unavailable to the public anywhere until now. Following is the first of three parts, virtually unedited from the original, of “In Search of Amelia Earhart,” by Fred Goerner for ORBIS Publishing, England. 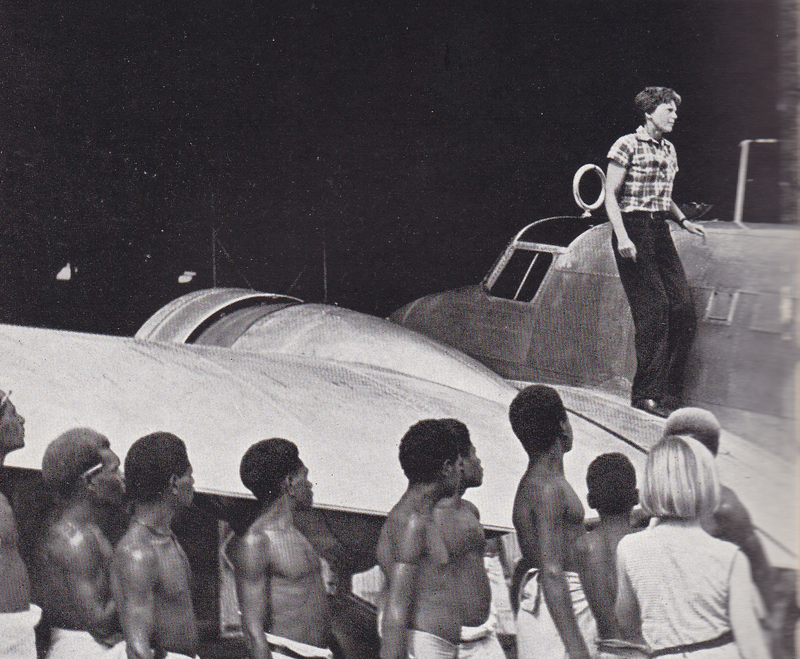 Amelia Earhart carefully taxied her Lockheed Electra 10-E twin-engine airliner to the takeoff stand at the Lae, New Guinea 3,000 feet runway. Behind the cockpit in the main cabin was Captain Frederick Noonan. He had secured all loose items and cinched tight the safety belts attached to his navigator’s chair. It was July 2, 1937. Amelia and Fred had often acknowledged that this would be the most difficult and dangerous part of their well-publicized around-the-world flight. Their course would take them over an expanse of Pacific Ocean never flown before: 2,556 miles, mostly over open water, bound for tiny Howland Island, a three-quarter by one-half-mile fleck of land just north of the equator where the U.S. Navy, Army Air Corps and Interior Departments had recently scratched out a rudimentary airfield. The U.S. Navy and Coast Guard had each provided a plane guard vessel. The Navy’s USS Ontario (AT-13) would be stationed in the open sea at the flight’s midpoint and the Coast Guard Cutter Itasca would anchor near Howland Island. Each would try to assist with communications and both could serve as rescue ships should Earhart and Noonan have to attempt an emergency landing on the ocean. Perhaps the most dangerous and difficult aspect of the endeavor would be the takeoff. the plane was grossly overloaded with 1050 gallons of 86 octane fuel together with 50 gallons of 100 octane gas to provide extra power to the twin 550 horsepower Pratt & Whitney Wasp engines for initial lift. Amelia had practiced such takeoffs at the Lockheed field in Burbank, California, but this was the first time during the world flight she would have to test what she had learned. She remembered all too clearly the nearly disastrous crash they had experienced on the attempted takeoff from Honolulu three months earlier. Carrying only 900 gallons of fuel, the Electra had begun to swerve on the takeoff run. The plane lurched to the left, then the nose began to come right. Amelia had overcorrected by pulling back on the left engine throttle, and “The Flying Laboratory” as she called her plane, careened into a vicious ground-loop, collapsing the landing gear. The Electra had come to a stop in a shower of sparks. Good fortune still followed her and those who flew with her. Despite the gasoline sprayed along the runway, there was no fire and no one had been injured; however, Captain Harry Manning, one of the two navigators, decided he had risked his life enough in the interests of Amelia Earhart and returned to his sea command, leaving only Fred Noonan to help Amelia find her way around the world. 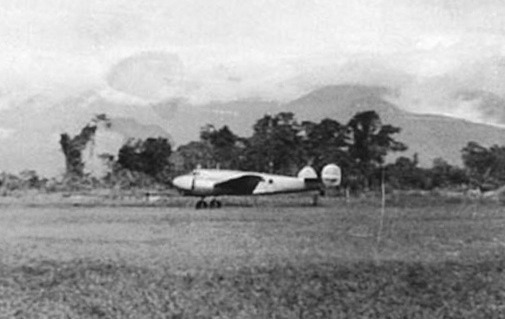 Guinea Airways employee Alan Board is credited with this photo of the Electra just before leaving the ground on its takeoff from Lae, New Guinea on the morning of July 2, 1937. This is the last known photo of the Earhart Electra, NR 16020. It was exactly 10 a.m. New Guinea time as the Electra spun into takeoff position. The bright controllable-pitch Hamilton Standard props whirled by the powerful Wasp engines chewed great holes in the air as Amelia checked the rpm’s and magnetos, sending a hurricane blasting back against the vibrating 55-foot wingspan. Satisfied with the performance of both engines, Amelia throttled back. The Guinea Airways mechanics had done a thorough job in making “The Flying Laboratory” as airworthy as possible. A brief test flight with light fuel load the day before had established the quality of their work. Amelia stared down the runway for a moment. Had they figured everything? She thought so. The air temperature and humidity matched the wind direction and velocity to provide the necessary lift given the weight of the aircraft and the length of runway. She and Fred had unloaded every ounce of personal baggage that could be spared. Even a few pounds could be crucial. After the Honolulu crackup, Johnson had repeatedly tutored Amelia in heavy-load takeoffs at the Burbank field, using an Electra similar to hers. At one point the look-alike Electra had wandered off the runway and into a ditch. The weight in that aircraft, however, had been iron bars, not gasoline. With a smooth, positive motion, Amelia pushed both throttles forward to full open, slipped the brakes, and the Electra began to lumber forward. The roar of the engines claimed the attention of a small band of spectators at the Guinea Airways’ hangars. The group included J.A. Collopy, District Superintendent of Civil Aviation for the Territory Of New Guinea; Harry Balfour, senior radio operator at the Lae Aerodrome; and technicians and pilots of Guinea Airways. A few minutes after the Electra disappeared from the sight of Lae, radio operator Harry Balfour received a long awaited weather forecast for the Earhart flight from the U.S. Navy Fleet Air Base at Pearl Harbor. The message had been routed through American Samoa and Suva, Fiji. As Amelia and Fred would be flying dead reckoning most of the day and night, it was vitally important that they know the wind directions so navigational corrections could be made for drift. Balfour heard no acknowledgment from Earhart, but assumed she had gotten the message and had simply been too busy to reply. At approximately 3 p.m. Lae time, Amelia’s voice came through Balfour’s receiver, clear and unhurried. The plane was flying at 10,000 feet, but she was going to reduce altitude because of thick banks of cumulus clouds ahead. Then at 5:20 p.m., she broke through again on 6210 kilocycles to announce they were currently at 7,000 feet and making 150 knots speed. The position reported was latitude 4 degrees 33 minutes South, longitude 159 degrees 06 minutes East, a point about 785 miles out from Lae and almost directly on course. The true ground speed was only about 111 knots, indicating the Electra was indeed bucking the headwinds mentioned in the U.S. Navy weather forecast. Earhart closed the broadcast by stating her next report would be on 3105 kilocycles, her nighttime frequency. Balfour radioed back that her signal was coming through strong and she should continue to use 6210. Amelia again did not acknowledge, and Balfour heard nothing more. To 34-year-old U.S. Navy Lt. Horace Blakeslee, the assignment as commanding officer and navigator of USS Ontario (AT-13) was both fascination and frustration. Ontario, a single screw seagoing tug launched in 1912, was the U.S. Navy’s only remaining coal-burning vessel, and serving as a plane guard ship for the Earhart flight stretched her capabilities to the maximum, In fact, Ontario was no longer considered fit for patrol duty and had been delegated the official yacht of the U.S. Navy Governor of American Samoa. To make the more than 1,200-mile voyage to the mid-point of the projected Earhart flight, remain on plane guard station for as much as two weeks and then return to the U.S. Navy Station at Tutuila, Samoa, Blakeslee fully loaded Ontario’s coal bunkers and piled a reserve supply on her decks. By the time Earhart and Noonan took off from Lae, New Guinea, Blakeslee and his crew had already been steaming up and down a small portion of Earhart’s announced flight path for 10 days. Consumption of coal and water was reaching a critical point. Blakeslee had no illusions that two-way communication between Earhart and Ontario could be established. The Electra had no low-frequency broadcast capability and the Ontario no high-frequency equipment. The Ontario was to broadcast the letter ‘N’ on 400 kilocycles with the ship’s call letters repeated at the end of each minute. With a low-frequency receiver, Earhart presumably could estimate her distance from Ontario by strength of signal. Her direction finder, restricted to high frequency signals, would be of no use to home on Ontario. With Earhart’s 5:20 p.m. reported position, the Electra was due over Ontario at approximately 10 p.m. Ontario time. Blakeslee recalls (and is substantiated by Ontario‘s official log) that at 10 p.m. the weather consisted of scattered cumulus clouds moving from the east-northeast and occasional showers. One of the watch officers believed he heard the sound of an approaching aircraft a few minutes after 10 p.m. and the Ontario searchlight swept the sky. The seagoing tug USS Ontario (AT-13) was assigned to a plane guard position at the projected mid-point of the Earhart flight. The watch officer said he heard the sound of an approaching aircraft a few minutes after 10 p.m., an aircraft that must have been the Electra, on course for Howland Island at that point. The 250-foot Coast Guard Cutter USS Itasca steamed slowly by Howland Island, barely keeping way. The radio room was fully manned, and a satellite station ashore on Howland housing a new and highly secret high-frequency radio direction finder was ready for action as well. The Itasca ‘s Captain, [Cmdr.] Warner Thompson, was not a happy man, however. He and the Coast Guard had the responsibility for assisting the Earhart plane to a safe landing at Howland, but he was now convinced that Itasca was being denied important information where the night was concerned. Try as he would Thompson could not find out exactly what frequencies Earhart was going to use or even the range of her direction finding equipment. Thompson was also not pleased with a number of persons he felt were looking over his shoulder aboard ship. There was Richard Blackburn Black, the Department of Interior representative who had arranged with the Navy and Army for construction of the Howland airfield and who was billed as Earhart’s personal representative. It was Black who had brought the hush-hush high-frequency direction finder aboard Itasca, and who had wanted to bring along a U.S. Navy radio expert to operate the apparatus. Thompson had flatly refused to use a Navy man on a Coast Guard ship, but under pressure had finally permitted a Navy radioman second class named Frank Cipriani to be trained in Hawaii in the use of the equipment. Also aboard were several U.S. army and U.S. Army Air Corps representatives along with the reporters from Associated Press and United Press. They all had their own interests and needs, none of which, Thompson felt, aided in the task of guiding the Earhart plane to a safe landfall. 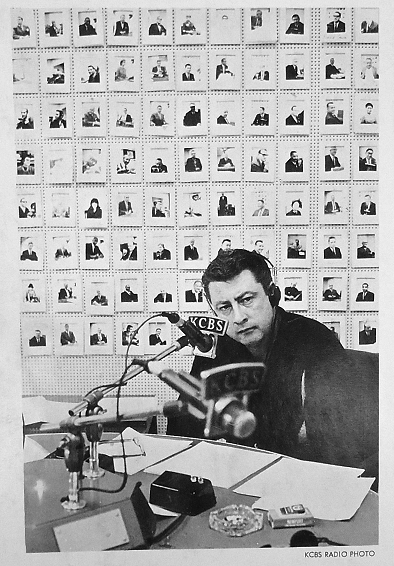 The Itasca radio room was crowded by midnight. The wire service correspondents jockeyed for position with the Army men. Coast Guard radiomen William Galten and Thomas O’Hare along with Chief Radioman Leo Bellarts hovered over the transmitters and receivers. It was a long wait. Earhart’s voice did not break through the static on 3105 kilocycles until 0245, and then all that could be clearly understood was “CLOUDY WEATHER . . . CLOUDY” an hour later at 0345, her voice was heard again saying “ITASCA FROM EARHART. ITASCA BROADCAST ON 3105 KILOCYCLES ON HOUR AND HALF-HOUR — REPEAT-BROADCAST ON 3105 KILOCYCLES ON HOUR AND HALF-HOUR. . . . OVERCAST”. The Itasca operators transmitted on 3105 asking Earhart to send on 500 kilocycles so the ship’s low frequency direction finder could get a fix on her. Obviously no one on Itasca knew that Earhart did not have the equipment to broadcast on 500 kilocycles. Amelia with the Bendix Radio Direction Finder Loop Antenna, which replaced Fred Hooven’s Radio Compass for use during her world flight attempt in 1937. Hooven was convinced that the change was responsible for Amelia’s failure to find Howland Island, and ultimately, for her tragic death on Saipan. We’ll have more on Hooven, his Radio Compass and other related topics in a future post. The only high-frequency direction finder available that could take a bearing on 3105 kilocycles was the Navy set ashore on Howland, and there the Coast Guard operator Cipriani was in a sweat. Earhart wasn’t staying on the air long enough for him to get a fix. The whistling into the mike helped, but it was too short as well. Another important factor was also disturbing Cipriani. The wet-cell batteries that powered the direction finder were beginning to run down. He could only pray that they would last long enough to give Earhart a proper heading. The atmosphere in the Itasca radio room was heavy with alarm. The operators redoubled their efforts, still pleading with Amelia to transmit on 500 kilocycles. The Itasca operators looked at each other in amazement. 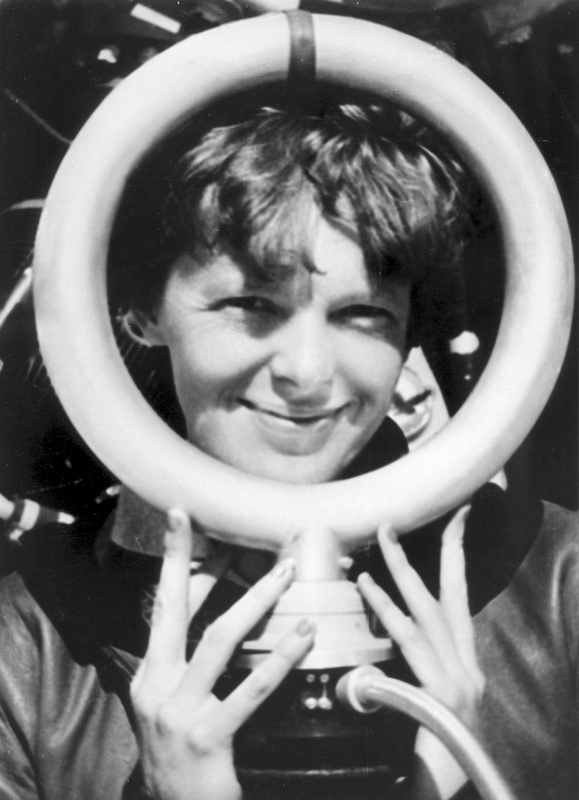 Now Earhart was trying to use her own direction finder, but none of them had any idea it ranged to 7500 kilocycles. Quickly the Itasca transmitter began to pour forth a stream of letter “A’s” on the suggested frequency. Almost immediately, at 0803, Amelia replied, “WE RECEIVED YOUR SIGNALS BUT UNABLE TO GET MINIMUM. PLEASE TAKE BEARING ON US AND ANSWER ON 3105 KILOCYCLES.” This time she made long dashes by depressing the microphone button, but still the Howland direction finder could not get a bearing. Cipriani shook his head in desperation. The batteries were almost completely discharged. Amelia was switching to her daytime frequency. Itasca‘s operators immediately monitored 6210 kilocycles but were greeted with nothing but static. An hour wore by. Still nothing. Some of the men went on deck and gazed up at the morning sky, hoping a miracle would bring Earhart and Noonan into sight. The horizon was empty save a weather front of cumulus clouds many miles to the northwest. Warner Thompson, Itasca‘s captain, waited until 10:30 a.m., then radioed Honolulu that the Earhart plane was probably down at sea and he was going to begin a search operation. 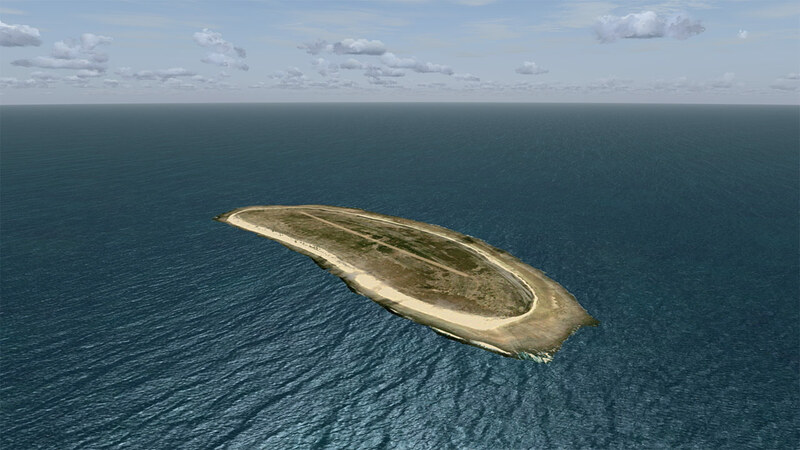 Howland Island itself. Thompson reasoned that the weather front to the northwest might have prevented Earhart and Noonan from seeing Howland, so he would search that area first. The disappearance took every headline in America along with most of the rest of the world. George Palmer Putnam, Amelia’s husband who was waiting in Oakland, Calif., was stunned, but he believed in his wife’s resourcefulness and he believed in her luck. Noonan’s wife, Mary Bea (Martinelli), told the press she was confident her Fred and Amelia would be rescued. She had married Fred Noonan just three weeks before the around-the-world flight began. President Franklin Delano Roosevelt, who had made the arrangements for U.S. Government cooperation with the flight, immediately ordered the American battleship USS Colorado which was on a summer reserve training cruise near the Hawaiian Islands to proceed at top speed to the Howland Island area to assist with the search. Colorado carried three catapult observation planes that could cover wide areas of ocean. Amelia’s had been literally a flight into yesterday. Because of the International Date Line, she and Fred Noonan had taken off from Lae, New Guinea, at 10 a.m. July 2, and the had vanished sometime after 8:43 a.m., July 2, Howland Island time. In the conclusion of Almon Gray’s “Amelia Earhart and Radio,” the former Pan American Airways radio flight officer examines further technical and other aspects of Amelia Earhart’s final flight, including the origin and effectiveness of the radio direction finder on Howland Island, some of the possible post-flight radio transmissions that may have originated from the Earhart Electra, and Fred Noonan’s alleged drinking problem as it may have affected the flight. As always, the real mystery is what transpired aboard the Electra in the hours before and after her last radio transmission, and the biggest question remains unanswered: Was Amelia actually attempting to reach Howland Island? If she was, then Gray’s conclusions remain highly relevant today. Obviously Earhart had a misconception of the radio direction finder installed on Howland Island. She apparently envisaged it as being a PAA type Adcock high frequency system, or its functional equivalent, which would take bearings on her 3105 kHz signals and send them to her just as the PAA station at Mokapu Point had done during her flight from Oakland to Honolulu. Because of that she repeatedly asked Itasca to take bearings on 3105 kHz and transmitted signals upon which bearings were expected to be taken. It appears that there may have been some justification for her having that concept. When the decision was made to fly easterly around the world, and the long Lae-Howland leg was being studied, Earhart and Noonan suggested to the Coast Guard that a radio direction finder be set up on Howland (“PLANE SUGGESTS DIRECTION FINDER BE SET UP ON ISLAND, IF PRACTICABLE”). According to the research of Capt. Laurance F. Safford, USN, it was at about this time that Mr. Richard B. Black, the Department of the Interior representative, who was to go to Howland in Itasca, conceived the idea of “borrowing” a so-called high frequency radio direction finder from the Navy to use on Howland Island. Black advised G.P. Putnam, Earhart’s husband and business manager, of his plans and advised him when the gear had been obtained and put aboard Itasca. No doubt Putnam passed this information along to Earhart. Richard B. 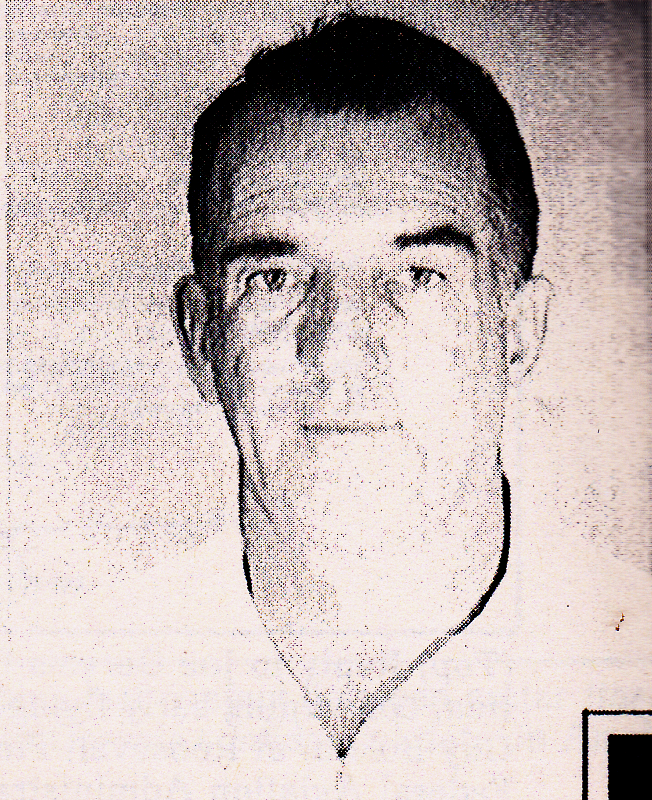 Black, the Interior Department representative who supervised construction of the Howland Island air strip for Amelia Earhart’s scheduled refueling stop. 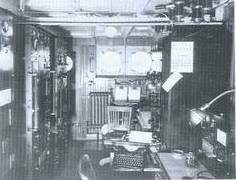 Black was in the radio room of Itasca, as Earhart sent her last known radio transmissions. As a lieutenant in the U.S. Naval Reserve in 1939, he was assigned as the U.S. Antarctic Service base commander, East Base, U.S. Antarctic Expedition. In 1954, Black served as the base operations officer of the first U.S. Navy Deep Freeze expedition. In a message sent June 27 to Commander, San Francisco Division, USCG, the C.O. Itasca [Cdr. Warner K. Thompson]reported on his readiness for supporting the upcoming flight. One item was “DIRECTION FINDER INSTALLED ON HOWLAND.” This fact was reported to Mr. Putnam, then in San Francisco, and he in turn passed the news to Earhart, who was then at Darwin, Australia. While the Itasca message did not specifically say “High Frequency Direction Finder,” there apparently had been sufficient other information, probably via telephone from Putnam, to cause Earhart to believe that it was such a device. She likely assumed that the DF had been installed at Howland in response to the suggestion made earlier by Noonan and herself , and fully expected it to be a functional equivalent of a PAA-Adcock system. According to Capt. Safford, who was in an excellent position to know, the direction finder station on Howland Island actually consisted of an aircraft type radio receiver and an aircraft type rotatable loop antenna which had been “hay-wired” together into a temporary DF installation. It operated off storage batteries borrowed from Itasca. The receiver and loop had been “moon-light requisitioned” (obtained by informal means) by Mr. Black and Lt. Daniel Cooper of the Army Air Corps, from a Navy patrol plane at Fleet Air Base, Pearl Harbor. The equipment appears to have been a military version, or perhaps a twin, of the Bendix receiver and loop in the Earhart plane. At any rate, with a loop antenna, it certainly was not a high frequency direction finder and the probability of taking meaningful bearings with it on 3105 kHz over any significant distance, was practically nil. The Howland DF operator [Radioman 2nd Class Frank Cipriani] had only two opportunities to try taking a bearing on the plane, and in each case the plane’s transmission was so short that a really good attempt could not be made. Had the transmissions been sufficiently long the operator no doubt would have found that he could get no “minimum” and hence no bearing. Note that these signals were heard about 12-and-a-half hours after Itasca last heard the plane. (a) The frequency (6210 kHz) was right for it being the plane. It was not a com­monly used frequency in that area. (b) The Nauru operator reported good signal strength and was able to judge the tone or timbre of the speaker’s voice yet was unable to understand what the speaker was saying. He suggested the possibility of modulation problems. The operator who had checked the plane at Lae and the DF operator at Howland who was trying to take a radio bearing on the plane, both had noted similar symptoms and suggested possible modulation problems. (c) The probability of there being more than one transmitter in the area exhibiting the same symptoms of over-modulation on the same frequencies at essentially the same time is very small. It is this writer’s opinion that the signals intercepted by Nauru were in fact from the Earhart plane no longer in flight. Capt. 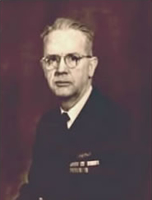 Laurance Safford, the father of Navy cryptology, who established the naval cryptologic organization after World War I and headed it, for the most part, though Pearl Harbor. Safford’s verdict on the Earhart disaster was that the fliers “were the victims of her over-confidence, an inadequate fuel supply, bad weather, poor planning . . . miserable radio communications and probable friction between the crew.” Did Safford know more about the fliers’ fates than he ever publicly admitted? At 0948 a phone signal of good intensity and well modulated by a voice but wavering badly suddenly came on 3105 kc. While the carrier frequency of this signal did not appear to vary appreciably, its strength did vary in an unusually erratic manner and at 0950, the carrier strength fell off to QSA 2 (2 on a scale of 0 to 5) with the wavering more noticeable than ever. At 0952, it went off completely. At 1212 (GMT July 5) I opened the DF guard on 3105 kc. At 1223 a very unsteady voice modulated carrier was observed on 3105 kc approximately. This transmission lasted until 1236 GMT. I was able to get an approximate bearing of 144 degrees. In spite of the extreme eccentricity of this signal during the entire length of the transmission, the splits were definite and pretty fair. After I obtained the observed bearing, I advised Midway to listen for the signal (couldn’t raise Honolulu). He apparently did not hear it. This signal started in at a carrier strength of QSA5 (5 on a scale of 0 to 5) and at 1236, when the transmission stopped, it had gradually petered out to QSA2 during the intervals when it was audible. The characteristics of this signal were identical with those of the signal heard the previous night (0948 GMT) except that at DF the complete periods of no signal occurred during shorter intervals. While no identification call letters were distinguished in either case, I was positive at that time that this was KHAQQ [Earhart’s plane]. At this date I am still of this opinion. Honolulu (Mokapu Point) also heard the “peculiar signal” on 3105 kHz several times. From 1523 to 1530 GMT July 4 an attempt was made to take a bearing on it, however due to weakness and shifting of the signal, only a rough bearing could be obtained. It was logged as 213 degrees, but it was implied that it was a doubtful bearing. Sometime between 0630 and 1225 GMT another bearing was attempted on the “peculiar signal.” The log describes it thus: “SIGNALS SO WEAK THAT IT WAS IMPOSSIBLE TO OBTAIN EVEN A FAIR CHECK. 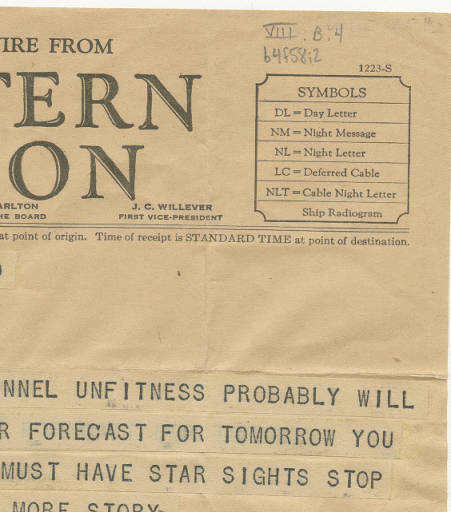 AVERAGE SEEMS TO BE AROUND 215 DEGREES — VERY DOUBTFUL BEARING .” It is obvious that the bearings from Honolulu were greatly inferior to those taken from Wake and Midway and are useful mainly as indications that the unknown station continued to function. Not much attention was paid to these interceptions at the time because no one was aware that Earhart’s radio signals had been abnormal. Had it been known that she was having over­ modulation problems more attention probably would have been given them because the “Wavering” in the carrier strength is consistent with a varying degree of over-modulation rapidly increasing and decreasing carrier power. The gradual drop of signal strength from QSA5 to QSA2 over a span of 13 minutes is consistent with the further discharge of an already partially discharged storage battery power supply. The peculiar signals on 3105 kHz heard by Wake, Midway and Honolulu may very well have come from the Earhart plane, and there is good reason to believe that the radio bearing taken on those signals by Wake was accurate within a degree or so. The one from Midway may have had a somewhat larger error. (a) Knowledge of the general principles of electricity and of the theory of radio­ telegraphy and radiotelephony. (b) Adjustment , operation and care of apparatus. (c) Transmitting and sound reading at a speed of not less than sixteen words a minute Continental Morse in code groups and twenty words a minute in plain language. (d) Use and care of storage battery or other auxiliary. (e) Knowledge of international regulations and Acts of Congress to regulate radio communications. Perhaps the last photo taken before the flyers’ July 2 takeoff from Lae, New Guinea. Mr. F.C. 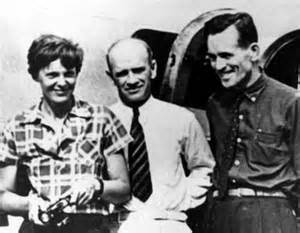 Jacobs of the New Guinea Gold Mining Company stands between Amelia Earhart and Fred Noonan. Note that Fred looks chipper and ready to go, not hung over from a night of drinking, as some have alleged. Those writing about the Earhart disappearance have, in general, been very rough on Noonan because of his admitted problem with alcohol. In some cases much rougher than was justified by the facts. For example in one book it is related that the night before the departure from Lae for Howland, Noonan went on a binge and did not get to the airfield until just before the plane was due to take off, and even then was so intoxicated that he had to be helped aboard the plane. The implication being that he was largely responsible for the failure of the flight. The official report of Guinea Airways Ltd., at Lae, made in response to a request from the U.S. Government, paints quite a different picture. 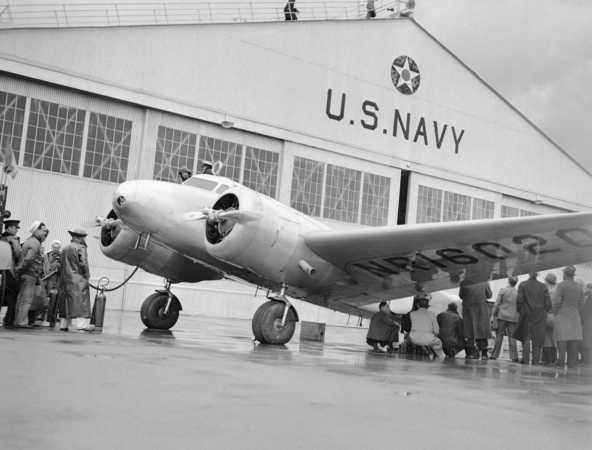 According to it the Lae wireless operator made attempts all throughout the day of June 30 to get time signals, requested by Earhart and Noonan, to permit Noonan to check his chronometer, but owing to local interference was unsuccessful that day. That indicates that Noonan spent most of June 30 at the radio station. At about this point, Earhart decided to take off for Howland Island at 9:30 a.m. on July 1, subject to obtaining the time signal. At 6:35 a.m. July 1st Earhart took the plane up on a 30-minute test hop after which the tanks were topped off and she was ready to go, except that a time signal had not yet been obtained. This day the difficulty was at the radio station which transmitted the signals. Extraordinary steps were taken to get a time signal but when one had not been obtained by 10:50 a.m. Earhart decided to postpone her departure until the next day, July 2. During the rest of the day constant watch was kept for the reception of time signals and finally at around 10:20 p.m. an excellent signal was received by Noonan which showed his chronometer to be three seconds slow. Noonan obviously had spent most of that day at the radio station. On July 2 at 8:00 a.m. another time signal was received, this one from Saigon, and the chronometer checked the same as the previous night. Both Noonan and Earhart expressed their complete satisfaction and decided to leave at 10:00 a.m., which they did. Only Noonan would have checked the chronometer, so the report seems to indicate clearly that Noonan was sober and in good shape at 8:00 a.m. and probably was that way when the plane took off. From the standpoint of radio, Earhart’s decision to rely completely on radiotelephony, and her removal of the trailing antenna, showed poor judgment and introduced unnecessary and unjustifiable risks. However it cannot be denied that she got as far as Lae without trouble with what she had. It was her mistake in designating 7500 kHz as the homing frequency for Itasca that got her into deep trouble. Even that difficulty probably could have been overcome had she been able to communicate with Itasca and agree on a suitable homing frequency. Fate intervened, however, and something occurred in her receiving system which made it impos­sible for Earhart to hear any signals with her gear set up in the configuration she was accustomed to use for communications. She did not understand the technical aspects of radio well enough to diagnose her problem and was not sufficiently familiar with the radio gear to know all the options available to her. She had been taught to shift the receiver to the loop antenna when she wanted to take a bearing, but probably no one had ever explained to her how the loop also could be used in carrying on communications. Had she been aware of that option and listened on the loop for Itasca‘s voice signals on 3105 kHz, no doubt she would have heard the ship and been able to establish two-way communications. The probability is very high that the failure of the receiving system to receive signals when using the fixed antenna was due either to a defective feed line between the receiver unit and the “send/receive” relay in the transmitter, or a defect in that relay itself. The odds are about 95 to 5 that the relay was at fault. It is considered therefore that a failure of that relay was the one single thing most responsible for the failure of the Earhart flight. (a) The landing was fairly successful. The plane did not nose over or break up, otherwise the radio could not have been used. (b) The landing was not in the open sea. Had it been, enough salt water would have seeped in to enter the wiring and disable the radio transmitting gear in a relatively short time. (c) Earhart survived the landing. She was heard by the Nauru operator long after the plane would have run out of gas. (d) Noonan survived. A man’s voice was distinctly heard on the “peculiar signal” by Midway. It was unintelligible. (e) Either Earhart or Noonan, or both, were alive and with the plane at least until 0948 July 5, 1937 GCT time and date. The “peculiar signals” were last heard then. Bill Prymak’s note: Capt. Gray, USNR (Ret.) received his Commercial Radio Operator License in 1930, and went with Pan American in 1935, when they started the trans-Pacific service. He became Flight Radio Officer on China Clipper type aircraft, and later was promoted to Assistant Superintendent of Communication in 1937. The AMELIA EARHART SOCIETY finds the above radio analysis of the last flight to be one of the finest pieces of work ever presented on this subject. Editor’s note: We should remember that in considering this analysis of Earhart’s final flight, Almon Gray took the position that the fliers were actually trying to reach Howland Island, and that all their actions were directed toward that goal. If Amelia and Noonan were not trying to reach Howland, but were engaged in some sort of covert operation, which certainly cannot be ruled based on our limited knowledge of what transpired during those final hours, then many of Gray’s findings become largely irrelevant. 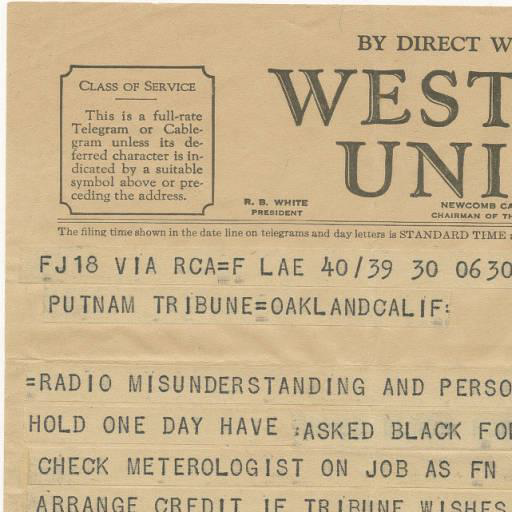 We continue with noted Pan American Airlines radio officer Almon Gray’s analysis of the radio problems that Amelia Earhart encountered during her final flight. Before we proceed, a word from the late Art Kennedy, an aircraft technician for the Pacific Airmotive Company in Burbank, Calif., during the 1930s, who directed the repairs of the Electra when it was shipped back to the Lockheed facility following the “ground-loop” at Luke Field, might be instructive. In Kennedy’s 1992 autobiography, High Times, Keeping ’em Flying, he was quite frank in his appraisal of Amelia’s radio skills, or lack of same. While we shall never have a positive and complete answer to the above questions, it is possible to deduce a great deal. Therefore there follows a hypothetical scenario which, it is believed, reflects quite accurately what actually transpired. It is emphasized that some parts are conjecture. 1. Earhart was at Bandung having maintenance done on the plane when the query came in from Itasca as to what radio frequencies she wished Itasca, Ontario and Swan to use in supporting her flight from Lae to Howland. Time was running out and she had to provide the answers right away. It had been pounded into her head time and time again that-she needed low frequency radio beacons for homing purposes. She knew that was what she wanted from the ships but she did not know what particular frequencies to specify. She therefore sought advise from the best local source available and arranged for herself and Noonan to meet with the top KLM airline communications man. (a) Ontario and Itasca would both use the same frequency but transmit at different times. This would allow Earhart to receive signals from both ships without the necessity of re-tuning her receiver. To avoid any uncertainty as to which ship’s signals were being received, Ontario would transmit the Morse code character for the letter “A” rather than the customary Morse “M O” as its homing signal. Itasca would transmit the Morse character for the letter “N” as its homing signal. These same characters (A and N) were used it identify the quadrants of the four-course radio ranges in the United States and Earhart could readily recognize them. Apparently it was envisaged that there would be an overlap of signal coverage over a good part of the leg, and that Earhart would be able to take bearings alternately on the two stations and thus keep on course. The frequency chosen for Ontario and Itasca was 400 kilocycles, which is equivalent to a wavelength of 750 meters. It was a frequency assigned worldwide for aeronautical radionavigation and was an excellent choice. It probably was chosen over equally good frequencies in the same band because it was easy to remember and easy to find on the receiver tuning dial. (b) Swan used the frequency of 333 kilocycles which is equivalent to a wavelength of 900 meters. Use it for voice communication with the plane if possible, but in any event be prepared to send homing signals on it. 333 kc was in the band allocated worldwide for aeronautical radio navigation and air-ground communications. It was widely used in Europe, the Commonwealth nations and other countries having close ties with Europe, as a calling frequency and for ground-air communications. Earhart had probably received on it during earlier legs of her flight but called it “nine hundred meters.” It was an excellent direction-finding frequency. 3. Noonan left the meeting satisfied that the radio navigational plans were adequate, or at least as good as could be developed. 4. Earhart went back to the hotel and drafted and dispatched her message of June 27 to Itasca (Black). She did not show the message to Noonan. (a) The frequency for Swan was changed from an intended 333 kilocycles (900 meters) to 900 kilocycles. One can readily deduce that the wavelength in meters was used but was labeled as frequency in kilocycles. (b) The frequency for Itasca was changed from an intended 400 kilocycles (750 meters) to 7.50 megacycles. Again it appears that the figures for the wavelength in meters were used but labeled as a frequency. Had normal air-ground communications existed between Itasca and the plane, the homing problem could almost certainly have been solved quickly. All that was needed was for Itasca to tell Earhart to home on 500 kHz, which frequency was already being transmitted (in addition to 7.50 MHz) by Itasca. She should have been able to get bearings on that frequency that would have taken her right in to the ship. Unfortunately she was unable to hear signals from Itasca on 3105 kHz, although the ship was hearing her well. It thus was impossible for Itasca and Earhart to coordinate their actions. 1. There was but one radio receiver aboard the plane and it was used for both communication and radio direction finding purposes. There were two antennas aboard, a conventional fixed antenna and a rotatable shielded loop. Either of these, but not both simultaneously, could be connected to the input of the receiver by means of an antenna selector switch on the receiver. Radio signals could be received on either antenna but usually were stronger when using the fixed antenna, therefore it was the one generally used for communications. Direction finding could be done only when using the loop antenna. 2. The fixed antenna was used for both receiving and transmitting purposes. There was a so-called “send-receive” relay in the transmitter which switched the antenna back and forth between the units. Normally the antenna was connected to the receiver, but when the relay was energized by pushing the “push to talk” button on the microphone, the antenna was switched over to the to the transmitter and remained that way until the microphone button was released. 3. Energy from the loop antenna went directly to the antenna selector switch of the receiver. Energy from the fixed antenna passed through the “send-receive” relay mentioned above before reaching the antenna selector switch of the receiver. 4. The receiver had six frequency bands; however, the vacuum tubes, voltage determining resistors, bypass capacitors etc., were for the most part, common to all band, and it was rare that a single band would fail. It usually was none or all. 5. The radio equipment aboard the plane was checked at Lae by Harry Balfour, the Guinea Airways wireless operator, and was found satisfactory. The only unusual thing noted was a roughness of the transmitted signal on 6216 kHz, which made Earhart’s speech difficult to understand. Two-way communication was maintained during a 30-minute test hop at Lae. Harry Balfour, circa 1937, the radio operator at Lae, New Guinea and the last person to carry on a two-way radio conversation with Amelia Earhart. At this time the signals from the plane were very strong. It is known that the Itasca was putting out strong signals and was on the correct frequency. (They were heard in San Francisco.) Therefore the statement “BEEN UNABLE TO REACH YOU BY RADIO” clearly indicated that a failure had occurred in her radio receiving system, and that it probably had occurred early in the flight. Inasmuch as she could still transmit it was obvious that the fixed antenna was intact; beyond that there was no clue as to the nature of the failure. That clue was given very shortly however. AT 1925 GCT Earhart asked Itasca to transmit signals “on 7500,” meaning 7.50 MHz. This indicated that she intended to take radio bearings on Itasca with the plane’s direction finder. Itasca complied immediately and sent the desired homing signals. The transmitter had no radiotelephone capability so it was impossible to also talk with the plane by voice on that frequency. Earhart responded immediately saying, “WE RECEIVED YOUR SIGNALS ON SEVENTY FIVE HUNDRED BUT UNABLE TO GET A MINIMUM. PLEASE TAKE BEARING ON US AND ANSWER THREE FIVE NAUGHT FIVE (3105 intended) WITH VOICE.” This was followed by a series of long dashed on 3105 kHz on which bearings were expected to be taken by Itasca/Howland. This was the first (and only) time Earhart acknowledged hearing signals from Itasca. From the fact that Earhart asked for the homing signals it is clear that she intended to take a bearing, which could be done only with the loop antenna. From her report of hearing the homing signal but being unable to get a minimum on it, it is obvious that she, in fact, shifted the receiver to the loop antenna, and that the homing signals were received on the loop antenna. Why could she receive 7500 kHz signals on the loop but not 3105 kHz on the fixed antenna? At the distances and time of day involved, propagation would not account for it, so something must have changed in the receiving system. Actually two changes had been made: (a) The receiver had been shifted from band IV which included 3105 kHz to Band V or VI, both of which included 7500 kHz and (b) The receiver had been shifted from the fixed antenna to the loop antenna. It is possible that some component peculiar to band IV had failed making reception on that band impossible, whereas reception on other bands would be normal. However, as mentioned previously, the probability of that happening was small, therefore it is unlikely that shifting bands, per se, made the difference between not receiving and receiving signals. Shifting antennas however was a horse of a very different color. With the antenna selector switch in the “DF” position incoming signals picked up by the loop antenna went directly to the input of the receiver. With the switch in that position Earhart heard signals from Itasca. With the antenna selector switch in the “FA” (Fixed Antenna) position, signals picked up by the fixed antenna did not go directly to the input of the receiver; instead they passed through contacts on the “send/receive” relay in the transmitter. With the switch in the “FA” position Earhart did not hear signals from Itasca. This indicates very strongly that signals from the fixed antenna were not reaching the receiver and that the receiver, in effect, had no antenna. The feed line from the fixed antenna was in two sections. One was between the antenna and the “send/receive” relay in the transmitter. This section was used both for receiving and for transmitting. Earhart’s transmissions were being heard, therefore this section, including the “send” part of the relay, was functioning. The other section was between the receiver input and the “send/receive” relay, including the “receive” part of the relay. There appears to have been an open circuit or a complete “ground” in this section, either of which would have prevented the receiver from picking up signals. It is possible that the wire in that section of the feed line broke or came loose from a binding post; however, that possibility is very small. It is much more likely that the trouble was in the “send/receive” relay. Those devices were subject to damage from several sources. Lightening or heavy static discharge sometimes burned the contacts completely off or welded them together. Contacts on the “receive” part of the relay were particularly subject to this type of damage. Mistuning of the transmitter or antenna sometimes caused arcing and subsequent pitting and sticking of contacts. And sometimes contacts would stick, or not make good contact, for no apparent reason. It should not be implied from this that the relays were inherently unreliable; they were not. Most went hundreds of hours between routine replacement with no trouble, but occasionally one would fail. This appears to have been one of those times. In this writer’s judgment the odds are about 95 to 5 that Earhart was unable to hear Itasca on 3105 kHz because she was switched to the fixed antenna and the “send/receive” relay was defective on the receive side. For the pilots and other technically astute readers among you, Almon Gray’s analysis might be easily understood, even if you disagree with some or all of his ideas. But for the lay person, which includes this writer, it’s not so easy to follow Gray’s narrative with clear comprehension. Just when I thought Gray was attributing Earhart’s radio failures to a misunderstanding about the meters and wavelengths that the “KLM man” was advising Earhart and Noonan to use during their meeting at Bandung, he launched into completely different set of reasons to explain the communications nightmare that was the final flight. I must admit that I don’t fully grasp the totality of Gray’s narrative thus far, and may never. Still, I think it’s important to present the important and unique work of experts like Almon Gray, regardless of how much I fail to understand. In the final segment of “Amelia Earhart and Radio,” Gray will examine some of the possible “post-flight signals” that have long been sources of controversy and contention among researchers, take a closer look at Fred Noonan’s role in the proceedings, and present his well-informed conclusions. Please stay tuned.